Kai-Zen and Tri-Zen – How Are They Different? The Tri-Zen and Kai-Zen (TZ/ KZ) strategies utilize competitive Indexed Universal Life (IUL) contracts as their funding vehicle. The only difference between the two is how they are structured (owner & premium payor). 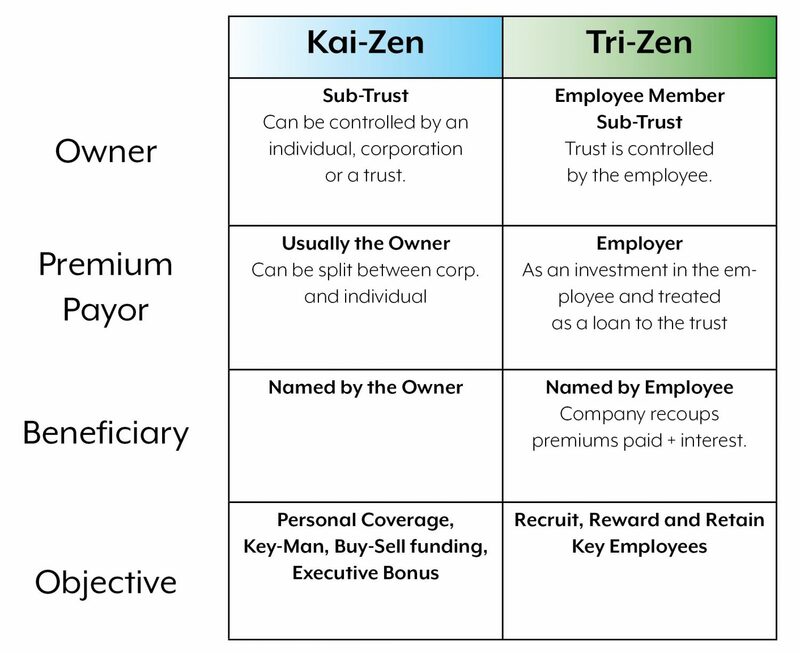 Tri-Zen’s owner is the employee’s trust and the premium payor is the employer. It is used predominantly in the non-profit marketplace but can also be used in the larger C-corps and publicly traded companies. Kai-Zen can be used almost everywhere else. When adding additional premium to these IUL contracts, via loans, nothing changes when pertaining to tax law or structure. Kai-Zen can be used as key man, split dollar, 162 bonus, a buy-sell funding vehicle, etc. The contracts are structured as if there was no financing so the parameters for ownership, vesting, beneficiaries, taxation, etc. are determined by what the client is trying to accomplish. In a nutshell, any strategy you can use with a traditional IUL, Kai-Zen and Tri-Zen just adds roughly 3 times the premium using financing in a way in which the owner need not qualify, sign or have to post any outside collateral for the loan.